HALIFAX, NOVA SCOTIA--(Marketwired - Jan. 22, 2014) - Erdene Resource Development Corp. (TSX:ERD) ("Erdene" or the "Company"), is pleased to report it has received final assay results for its Q4 2013 trenching program at the Company's 100% owned Altan Nar gold-polymetallic project in southwest Mongolia. "We are extremely pleased with the results generated from this program. 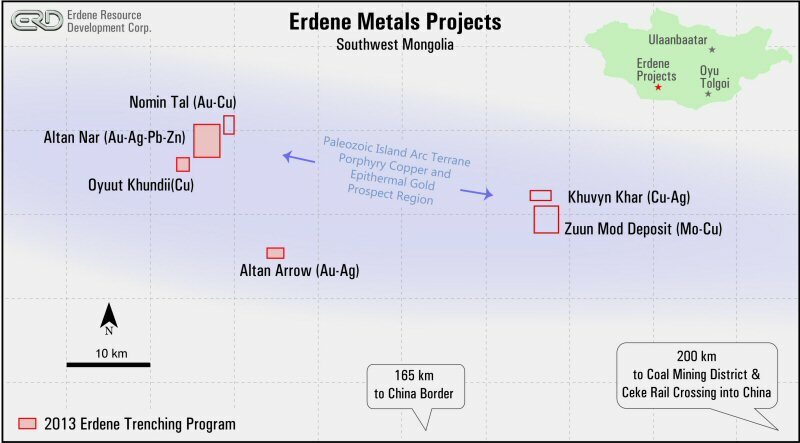 We have discovered multiple new zones, broad areas of mineralization, confirmed that the potential for new discoveries extends over the 5.5 kilometre strike length, and have identified high-grade mineralized shoots," said Peter Akerley, President and CEO of Erdene. 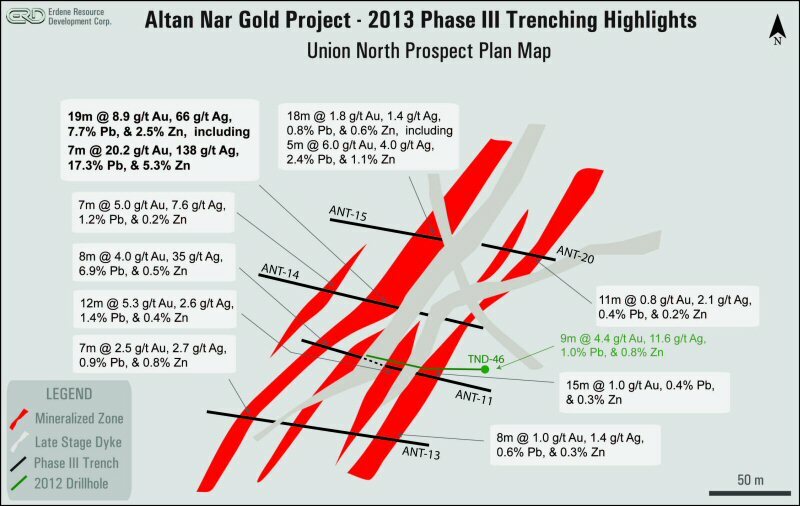 "There is little question that Altan Nar not only has the potential for multiple, bulk mineable open pits with high grade shoots, but now represents one of the most significant metal discoveries in Mongolia since Oyu Tolgoi in the mid-1990's. We will now accelerate our efforts for the 2014 exploration season and move this very exciting project towards early development." 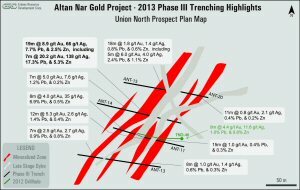 The following table provides the latest, previously unreported, results from the Altan Nar trenching program carried out in Q4 2013. The trenching results announced today include three areas in the Central Altan Nar Area: Riverside, Union North and Union South. The following describes each of these target areas and the trenching results. Also, included for reference, are maps and a cross-section showing the location of the trenches and orientation of the mineralized zones. Located 1.3 kilometres northwest of the Discovery Zone, Union North is characterized by north-trending IP chargeability highs with coincident gold geochemical anomalies and locally quartz rubble that can be traced over a 1.3 kilometre strike length to the Union South prospect. Previous drilling (TND-46) returned 47 metres of 1.3 g/t gold, including 9 metres of 4.3 g/t gold, 12 g/t silver, and 1.7% combined lead-zinc. This target is centered on what appears to be a structural intersection and a dilatant offset in the host structure which provided the conduit for more intense, episodic pulses of mineralizing fluids. Five trenches tested the zone within a 150 metre x 150 metre area (see attached map and section). Trench ANT-13 marks the southern extent tested and ANT-15 and ANT-20 the northern extent. The central trenches (ANT-11 and ANT-14) and single drill hole (TND-46) returned very high grades in multiple intersections with up to 20.2 g/t gold, 138 g/t silver, 17% lead and 5.3% zinc over 7 metres. The mineralized zone is characterized by multiple, sub-vertical stockwork breccia shoots, 2 to 20 metres wide, hosted by an andesite volcanic package subsequently cut by porphyritic dykes. Mineralization and alteration are characterized by iron oxides, black quartz and very fine black sulphide material, massive galena, quartz breccia and veins in the higher grade zones, and stockwork stringer veinlets in the lower grade zones. The entire mineralized package is hosted in zones of intense phyllic (sericite-quartz-pyrite) alteration. At least two high grade shoots, 7 to 20 metres wide have been identified to date. The more significant of the two is a new discovery just west of the projected extent of drill hole TND-46. The zone is open to the north and south. With these recent discoveries it is becoming apparent that the shallow overburden cover can mask even high grade zones and that the property contains many untested targets. Approximately 550 metres south of ANT-13, the southern-most trench in Union North, is trench ANT-24, which tested a small area of quartz float, and a single multi-element geochemical anomaly, coincident with a magnetic low and IP high anomaly under shallow cover. Again, a covered, high grade zone was discovered within one metre from surface that returned 10 metres of 4.46 g/t gold, 8.9 g/t silver and 2.2% lead characterized by intense alteration with significant quartz breccia, veining and stockwork and was well mineralized with galena, trace turquoise, iron oxides, and manganese oxides. This trench is 100 metres north of drillhole TND-29 which intersected 18 metres of 1.0 g/t gold including 4 metres of 3.7 g/t gold. These results demonstrate tremendous potential in this area. Union South and Union North represent a combined 1.3 kilometre long target. Characterized by an 800 metre long gradient IP and geochemical anomaly, less intense than the adjacent Union (North and South) to the east and Northbow/Southbow targets to the west, the Riverside target was tested by six relatively short trenches. 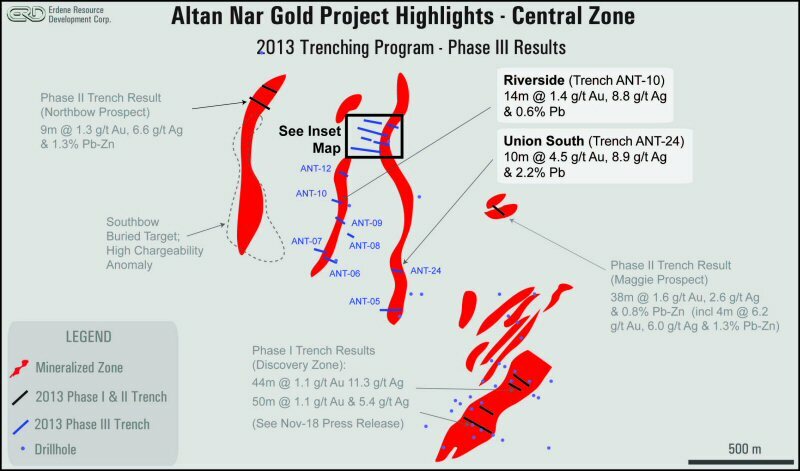 As indicated by previous drilling the Riverside prospect is well mineralized but tends to average less than 1 g/t gold in the southern portion (Trenches ANT-06,07,08,09) increasing in grade moving north (Trenches ANT-10 and ANT-12) to the point where it potentially merges into the Union North target. 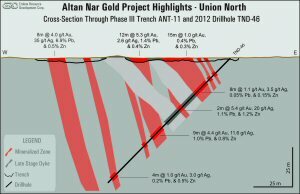 ANT-10, located approximately 250 metres south of ANT-13 (south end of Union North) returned 14 metres of 1.4 g/t gold. This program met the planned objectives, to further define the near-surface mineralization identified to date, improve the understanding of the gold mineralized system and prioritize new areas for the next phase of exploration. The surface expression of the Altan Nar project area is one of low relief with thin Quaternary cover over much of the area, interspersed with low rolling hills. The intense weathering of the altered, sulfide-rich, stockwork breccia zones leaves little surface expression of the targets and little indication of their size other than remnant quartz rubble. As a result, the extent of alteration and mineralization observed in the trenches commonly exceeded that indicated by surface expression. A combination of mapping, geochemical and geophysical surveys has been successful in guiding our exploration to date however it is obvious from the recent program that even the subtlest of anomalies may indicate high grade mineralization under shallow cover and therefore a significant expansion in the surface work will be part of the 2014 program. 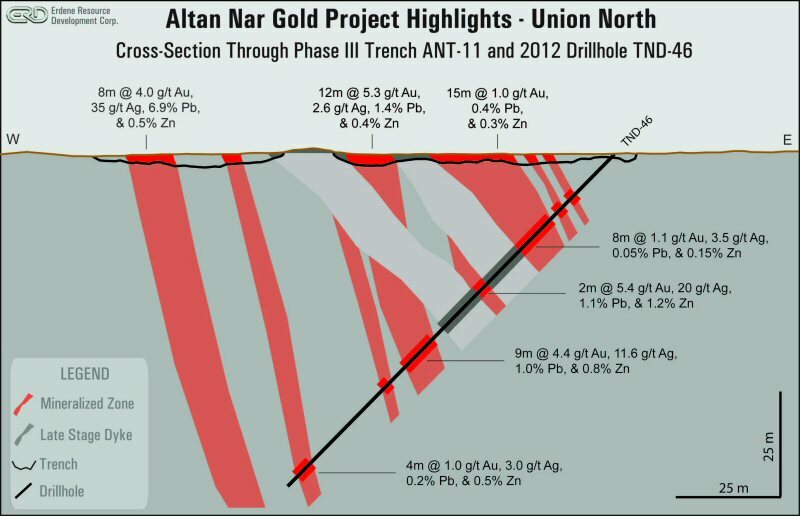 To date, the Altan Nar targets have not been tested below 250 metres vertical depth; however multiple holes have ended in strong gold mineralization. The exploration data generated by this program will now be used to develop conceptual plans for initial open pit development. These trench results, in conjunction with previous drill results, confirm the potential for a shallow, large, bulk-tonnage, gold-silver-lead-zinc mineralized system. 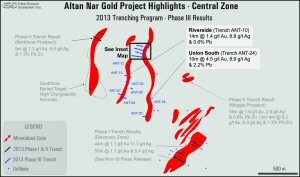 Following the compilation and interpretation of these results, the Company will begin planning the next program to define new resources and evaluate additional targets within the Altan Nar property. Certain information regarding Erdene contained herein may constitute forward-looking statements within the meaning of applicable securities laws. Forward-looking statements may include estimates, plans, expectations, opinions, forecasts, projections, guidance or other statements that are not statements of fact. Although Erdene believes the expectations reflected in such forward-looking statements are reasonable, it can give no assurance such expectations will prove to have been correct. 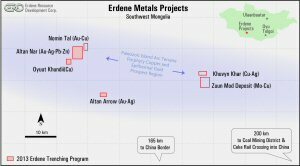 Erdene cautions that actual performance will be affected by a number of factors, most of which are beyond its control, and that future events and results may vary substantially from what Erdene currently foresees. Factors that could cause actual results to differ materially from those in forward-looking statements include market prices, exploitation and exploration results, continued availability of capital and financing and general economic, market or business conditions. The forward-looking statements are expressly qualified in their entirety by this cautionary statement. The information contained herein is stated as of the current date and is subject to change after that date. Erdene does not assume the obligation to revise or update these forward-looking statements, except as may be required under applicable securities laws.